Superman created by Jerry Siegel and Joe Shuster. By special arrangement with the Jerry Siegel Family. 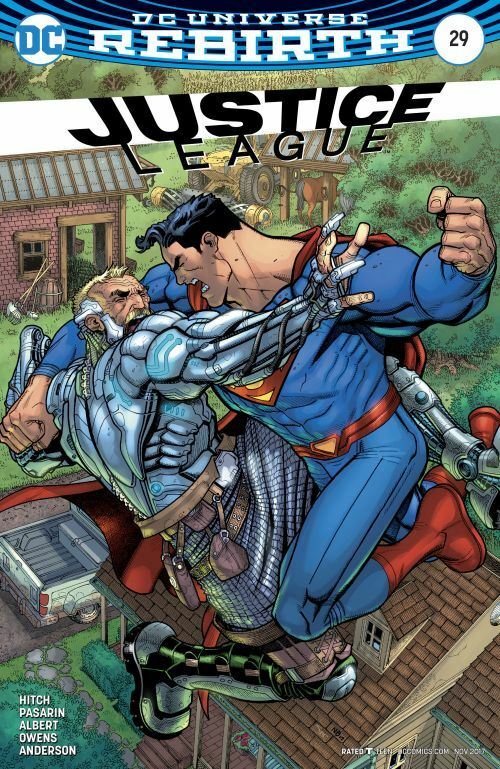 After a few issues of build-up, the action really gets going in Justice League 29, as the children of the Leaguers turn on their parents. But the kids are not the only ones on the attack. The Aquaman of the future has also come back in time, and he is going after the other members of the League as well. In my review for the previous issue I commented on how Hitch is finally paying off his run, and that holds true for this issue as well. He took time to really introduce us to the children of the League, and we got to see their various interactions with their parents. Now, when the fur starts flying, there is more emotional context to it all. Batman takes some time off from his League to stop by and help this one cope with the situation. Mind you, he is partly responsible, as the future Aquaman raided his Batcave for weaponry to use against the other Leaguers. Lois Lane gets to chew out Batman for inventing yet another device to harm her husband. The art on this issue is good, but for a change there is a lack of huge crumbling cityscapes for Pasarin to render. I’ve kind of grown used to the League fighting amidst ruins, it has happened so much in this run. And Pasarin draws ruins so well. No ruins this time. Almost ruined it for me. Well, no, it didn’t, but I felt the pun needed to be made. I can’t say this issue is as good as the previous two, but it’s still miles above what had come before this storyline, and continues to bode well for the remainder of it.